Dec. 11, 2017 – Hardships, perseverance and acts of kindness distinguished 28 adult learners ages ranging in age from 16 to 60 as they were inducted into the National Adult Education Honor Society on Monday. 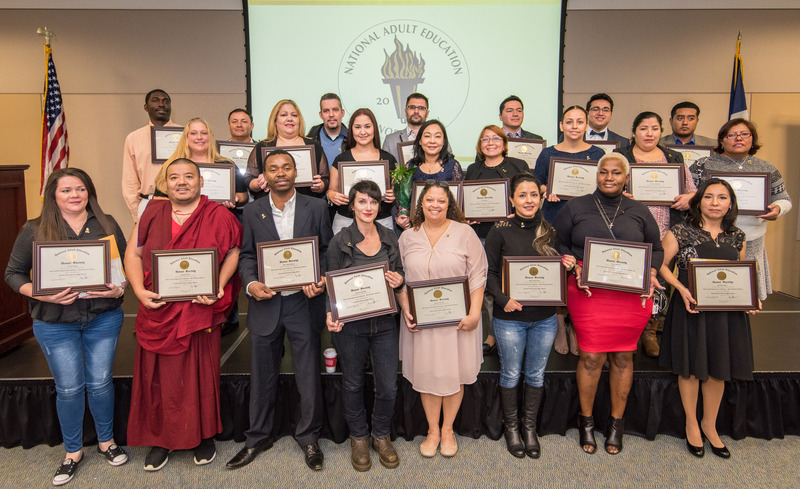 The ceremony, at Harris County Department of Education, brought together a diverse group of students and their steadfast supporters, including family members and teachers. All of the students attend classes offered through HCDE’s Adult Education division in community learning locations throughout the county. Induction into the National Adult Honor Society brings notoriety and written recommendations for future employment and education advancement. HCDE provides free classes in English as a second language, GED and workforce development at 50 locations throughout Harris and Liberty counties on a first-come, first-served basis. Communities include Alief, Baytown, Channelview, Cy-Fair, Deer Park, Galena Park, Goose Creek, Katy, Klein, Pasadena, Sheldon, Spring Branch and Liberty. For more information about classes, go to www.hcde-texas.org/adulteducation . Chhayamba Nupu Lama from HCDE’s ESL classroom located at the Salvation Army in Spring Branch is one of the 28 students being inducted into the honor society. He is a Buddhist monk who rides his bike to class each day and helps his fellow classmates with homework. He is learning English as his third language after already being fluent in Tibetan and Nepali. He is learning English in hopes of becoming a professional Tibetan-English interpreter and plans to specialize someday in management of nonprofit organizations. His teacher Jill Kaeser says her student is always calm, cheerful and inclusive with his classmates and assists others without being asked. Melissa Long is a middle-aged GED student attending classes in Katy. Her teacher Lavenia Cole says Long entered her class as a self-doubting, hesitant student but has since blossomed in to a confident, engaging learner who helps her fellow classmates. Long is a full-time bus driver who likes to motivate the children who ride on her route. Her own childhood was filled with intimidation and verbal abuse from her father. As an adult, it negatively affected her own personal relationships. Today she has shifted her focus on to her spiritual beliefs to help improve her life and the lives of others. She is achieving high scores on her GED practice tests, and she likes to help her classmates. She will take the GED in spring 2018 and hopes to participate in the HCDE graduation in May. Diego Diaz obtained his medical doctorate degree in El Salvador. His position in his home country is equivalent to a general practitioner in America. He currently has a Green Card and will obtain his citizenship in 2018. Diego is currently working on his GED at HCDE and is also enrolled in the certified nursing assistant workforce program. Diaz had to leave his family in El Salvador to pursue the American dream for his family. After he gains his citizenship along with his nursing certification and GED, he will send for his family. His teacher Arbrenia Bryant says Diaz is always willing to translate and provide clarity about medical terminology for his classmates.